I had recently moved to a state where I didn't know anyone when one of my husband's new colleagues asked me the inevitable question, "And what do you do?" I could have said "I'm a mom," or "I used to be a teacher," or "Too much Facebook and not enough laundry," but something stopped me. "Well..." I began. The other woman sensed my hesitation and laughed. "You don't know?" She teased me. "No, it's just..." I gulped. "I'm trying out a new word." "Ohhh," she nodded. She seemed like the kind of person who could appreciate the importance of such a moment. Her eyebrows went up as she waited for me to spit it out. "I'm... I'm working on being able to say that I'm a writer," I finally exhaled. Then I stood there blinking. I had done it. By that point, I had been blogging for years, so I had written quite a few words, but I'd never called myself a writer. But there on the sidewalk outside my husband's office, I took an identity I'd always wanted and just--pinned it on. Shortly after that encounter, I worked up the courage to tiptoe further into the writing world: to enroll in an MFA program, to send out some pieces for publication, to work (and work and work and work and work) on a book I'd long wanted to write. But I think the moment I really became a writer was in that conversation on the sidewalk. That moment I took a word that was out there in the world and claimed it as my own. I think words are pretty important. The words we use for ourselves. The words we use for others. The words we use for God. And so, I'm a writer: because I think taking the time to find just the right word is time well-spent. Because words are powerful. Because I want to understand who I am, and what my place is in this universe. Sarah Sanderson writes and speaks about faith, mental illness, abuse recovery, parenting, and everyday life. She holds an English and Philosophy degree from Wheaton College, IL, a Master in Teaching degree from Seattle University, and (as of August 2018) a Master of Fine Arts in creative writing from Seattle Pacific University. 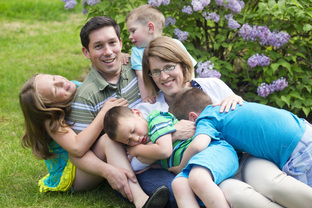 Sarah and her husband, Jeremy, parent their four children in a suburb of Portland, Oregon, where Jeremy pastors Oak Hills Church. She is on a lifelong quest to achieve two things: the perfect sunny powder ski day, and an error-free Sunday New York Times crossword (in pen). That second goal is harder, but considerably cheaper, than the first.